To my regular readers, sorry for the long delay. I've been meaning to write this for a long time now. Since March, actually. If you refer back to the previous article about rebuilding the brew cart, "The Cart After the Horse", you'll notice some design changes from the original sketch. The original sketch had the plywood on top to add some torsional rigidity to the parallelogram of 2x4's. 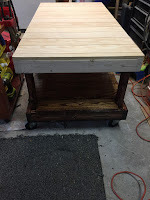 However, what I realized during construction is that the design left very little clearance between the bolts for the 2x4 construction and the screws for the large swivel casters. So, the design was modified and I added a second layer of shiplap boards to create a bottom shelf. Additionally, I added 2.5 inch drain holes to the 4 corners of the plywood, should any liquids make their way through the layer of shiplap. I could have gone all crazy and used stainless steel hardware everywhere, but the old cart used plated fasteners and I found very little corrosion when I took it aparts so I used cheaper grade 5 stuff. Having a miter saw and a drill press made the whole job a lot easier than the last time I built a cart like this. I used square drive decking screws to fasten the plywood down along with a nice bead of carpenter's glue. 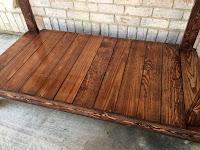 I used an "Early American 230" penetrating stain from Minwax to add some color to bring out the grain of the wood and provide an oil-based seal. 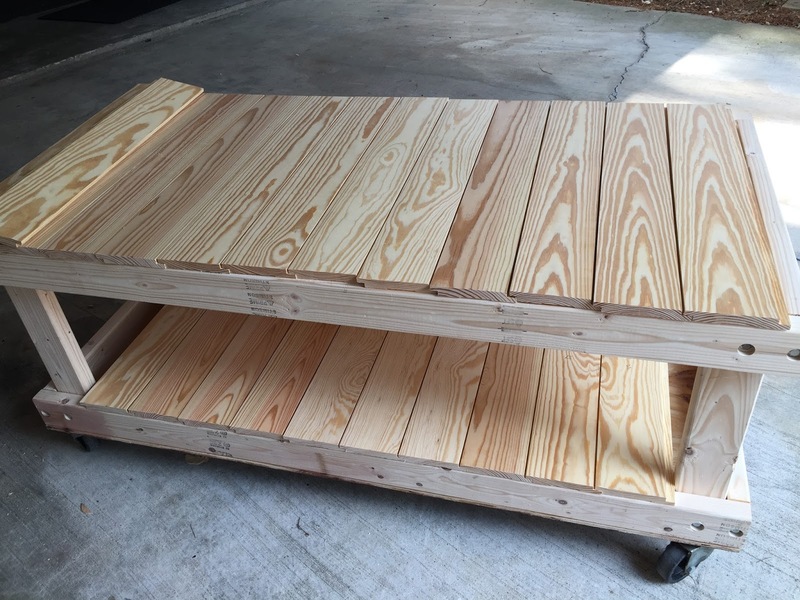 This cart will see a lot of water over the years, so sealing all the wood pores is vital to its longevity. 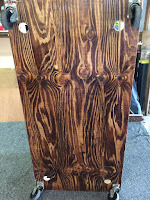 The bottom of the plywood was stained as above before anything else and sealed with a water-based polyurethane. Hopefully, it will never bee seen again so this step was just to prevent water damage. boards that didn't match or had any imperfections were assigned to bottom shelf duties. My daughter has an eye for art, so I asked her to help with choosing the right arrangement of boards. Although unplanned, the math worked out well for the boards between the 2x4 uprights. 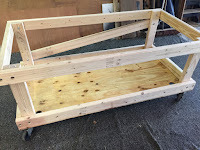 Had I thought of it sooner, I would have also run a center support, lengthwise on top of the plywood so that I had something to fasten the shorter boards to (between the uprights). As it turned out, I used shorter pieces of scrap 2x4 under the edge of the last full board to support the shorter boards. Problem solved if a little inelegant. All the lap joints of the shiplap were glued with carpenter's glue in an attempt to make the shelf water-tight. 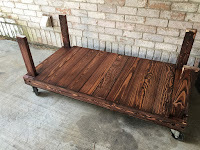 The same Early American stain was applied after several hours of sanding. The 2x4's required more sanding than the shiplap as you might expect, but sanding down to 320 grit really makes the grain stand out, even on prime 2x4's which are still much less expensive than real hardwoods. 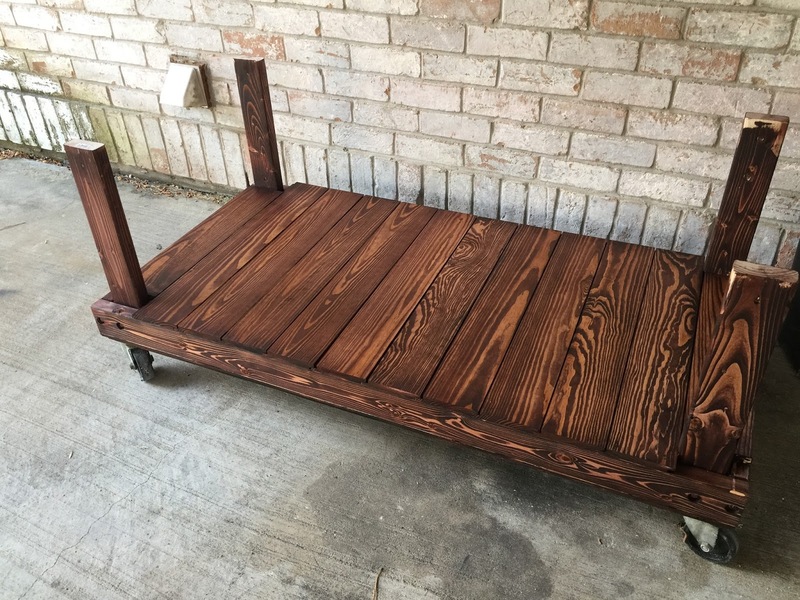 I let the stain soak in and dry for 48 hours and then began the application of Waterlox Original (as mentioned in The Cart After the Horse). 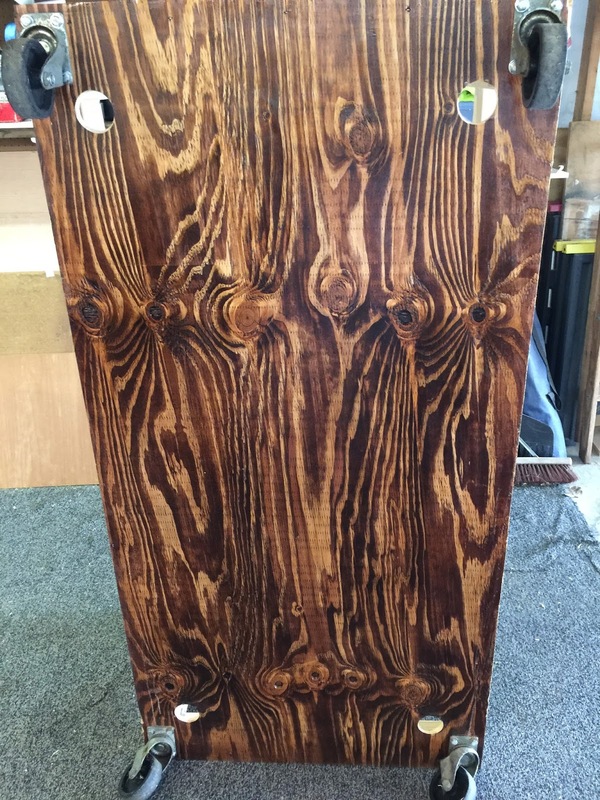 You can see in the photos that the Waterlox actually increases the amount of yellow hues and softens the contrast in the grain. The top shelf was constructed along the same lines, but as you can see from the layout photo, the number of shiplap boards didn't fit exactly. I used this to my advantage by ripping the last board in half so that I could used square (unlapped) boards to place as end caps. 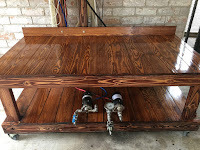 The top shelf was sanded out in the driveway while more coats of Waterlox was applied to the bottoms shelf in the garage, away from the sanding dust. This allowed me to work on two things at once, switching back and forth. Finally, the top was stained and fitted to the bottom after drying for 48 hours. I bought one more piece of shiplap to make a backsplash. This was more to prevent things from rolling behind the cart than worrying about splashing. Forgot to mention that the shiplap was fastened to the 2x4 rails with a pneumatic staple gun, like you would use for hardwood flooring. The staples are on the lap tongues so that they are not exposed. I had to turn the air pressure down to 40psi to keep the staples from ripping the softwood apart like paper and fine tune the fit with a nail set. 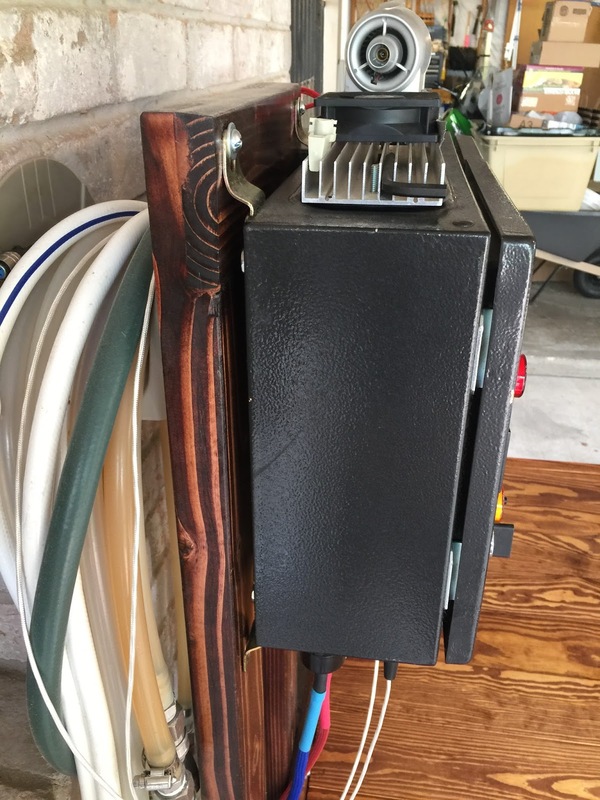 After several coats of Waterlox, I built a 2x4 upright to hang the electrical box on. The backsplash I added after the design meant that I had to cut small pieces of shiplap board to acts as spacers for the lower fasteners. This is the only place I used stainless hardware since it would be exposed. 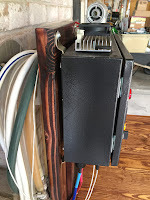 One of the things I learned from the old cart was that my silicone hoses were too long to hang from the side of the cart so I added the hose hanger on the back of the control panel. This lets them hang down without needing to be looped around and that allows them to drain. The last step was adding the pumps to the bottom shelf. I used T-nuts on the bottom of the shiplap boards to I could "bolt" the pumps down and it wouldn't be a major undertaking to remove one. I've had pumps go bad before. pine and poplar is significant when you put this much together and oak would have been heavier than that. Not to mention a ton more expensive. Other than the fasteners and finish, the lumber for this project was under $100 with the shiplap eating up 3/4 of that number. Many of the fasteners were recycled from the old cart as well as the casters. I've used the cart for a couple of brew sessions and the pine shiplap will not take much of a beating. I put a big dent in one board just moving the mash tun to empty it. 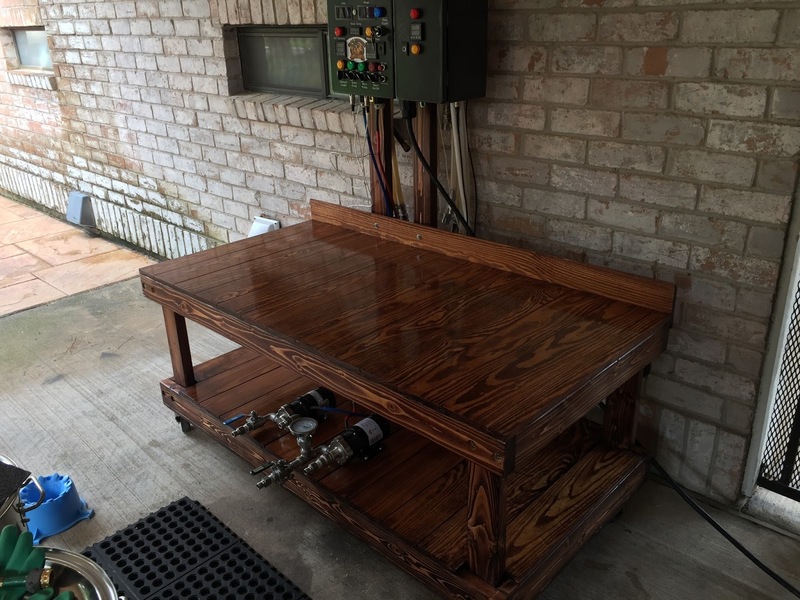 However, moving from the garage to the carport for brewing is so much easier due to the reduced weight. Click the link to request to join the group. DIY Refrigerator Repair. Now 20% Easier!